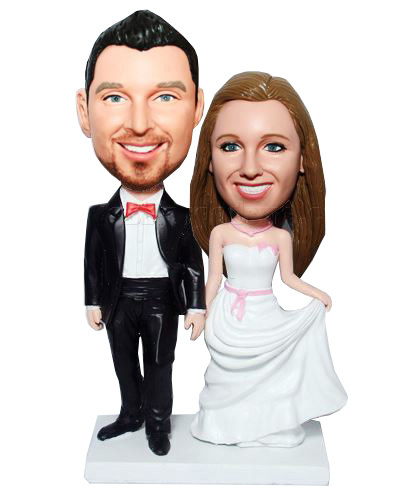 This custom bobble head depicts a groom dressed in sharp black suit with a red bow tie. Left hand holding his wife's hand, the pose is spruce. On the other hand, the customized bobblehead bride is dressed up in a long style wedding dress featuring a pink waist belt, kilting her dress a little,so elegant.It is perfect to be a wedding cake topper or anniversary gift. The service was absolutely fantastic and very professional. All my questions were answered very promptly. When we received our wedding cake topper we were absolutely delighted - it is fantastic and amazing quality. I can highly recommend this company to anyone who wants something unique for their wedding. Thanks very much!! !